There was a western history periodical called The Pony Express which was published out of Sonora, California in Tuolumne County. The periodical has many great historical accounts from testimony of early pioneers and first families who settled in the Central California area. The Pony Express is a rare find for any persons wanting to know the early history of California in the Central Valley and the high Sierra Nevada. The Pony Express not only had articles and historical accounts in almost every periodical the The Pony Express had one poem about the history of the area. The poems were done in the classic style of Cowboy Poetry which is popular in the West. Here is one that is of interest to the Paiute people which was sent to me. The person said it was done in the late 1940s. Once again because the people working at The Pony Express were historians they knew that the Paiutes were the original indigenous people of the beautiful Yosemite Valley. 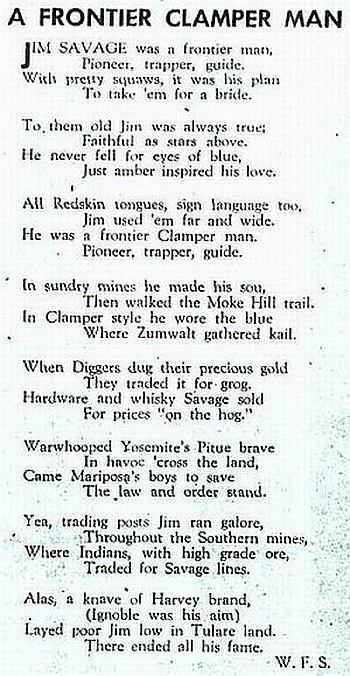 This poem in the Pony Express was a tribute to James Savage, who by the way was not a hero to the Yosemite Paiute people. To take’em for a bride. Just amber inspired his love. Jim used ‘em far and wide. He was a frontier Clamper man. Then walked the Moke Hill trail. They traded it for grog. The law and order stand. Layed poor Jim low in Tulare land. There ended all his fame. “Pitue brave” is a referrence to Paiutes. Paiutes have been written as Piute, Pah-ute, Pi-ute, Pitues, and other ways. But the poem still states that the Yosemite Indians were Paiutes. The poem about James Savage, refered to as Jim, talks about Savage’s Indian wives for the western side, which it was written he had about a dozen ranging from all ages starting from around nine years old. In the poem it states that James (Jim) Savage spoke many Native Californian langauges of the tribes on the western side, meaning that he spoke Miwok and probably Yokut. Also the poem states that the Diggers (Indians from the western side) dug Savage’s gold and made him well-off. Savage also built a trading post. That the Yosemite Paiutes caused “trouble” to the miners and Savage’s trading post, which the western tribes used to bring in gold to trade with him. Also the the Mariposa Battalion led by James Savage took care of the gold miners problem by ’subduing’ the Yosemite Paiutes. Finally the poem ends with the death of James Savage at the hands of a man named Harvey who shot and killed Savage in the Central Valley. What is very cool is that this small poem found in The Pony Express tells many aspects of the legend of James Savage and the true identity of the Yosemite American Indians. Clampers are dedicated to the history of the Gold Rush, western history and minning, sometimes in a satrical way. There is even a James Savage branch of Clampers in Madera. This poem, created by early cowboy poets shows that Paiutes were the original American Indians of Yosemite Valley.